Most computers have a hidden recovery partition which contains recovery files required to repair or restore your computer. 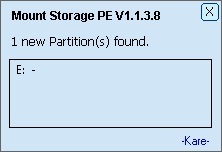 These partitions appear as OEM Partitions in Windows Disk Management. Unfortunately these Hidden OEM Partition cannot be mounted with a drive letter using Windows Disk Management. 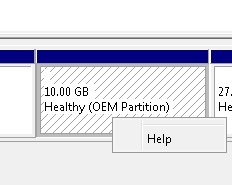 Right clicking on the hidden partition does not give any options. So if you want to view the contents of this Hidden OEM Partition, you will have to unhide it using a Partition Management tool like Bootice. However unhiding and hiding it maybe cumbersome and if the partition is not hidden properly the recovery tools may not work properly. Fortunately there is simple way to mount such hidden OEM partitions without unhiding it using Partition Management tools. MountStorPE short for Mount Storage PE is a tool which is primarily used in Pre-Installations Environments (PE) to assign drive letters to USB disks connected after system boot. An interesting feature of this tool is that it assigns drive letters and mounts hidden partitions. Mounting hidden and OEM partitions without Unhiding it. Extract the zip file and run MountStorPE.exe located in the Files folder. You will get a dialog box indicating the number of drives mounted and the drive letters assigned to them. You can now navigate the hidden partition in Windows Explorer using the drive letter assigned by MountStorPE. The hidden partition is mounted only for the current session. Once you reboot everything is normal. The partition is hidden and not mounted. Extract Dosdev from the downloaded zip file and run the below command replacing the drive letter with the letter that was assigned to your mounted hidden partition. In the example below, J: was assigned to the mounted hidden partition. nice article. clearly explained .. any alternatives for Linux – Fedora ? It works in Windows 8.1! Thanks! Doesn’t work. Shows the drive but can’t copy the files. Says it can’t perform a security operation on an object with no security.